the army marched toward Orleans as planned. singing priests leading the way for four thousand. 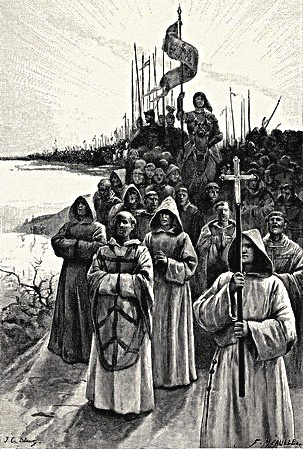 "The day we quitted Blois to go to Orleans, Joan had all the priests gathered around the banner and they led the march with the soldiers following. We marched out of the city by the side of the Sologne assembled in that fashion while we sang Veni Creator Spiritus along with several other anthems." For Joan this was the day she had been longing for, to finally take command of the army and lead them forward to fulfill the mission given to her by God to save France. Veni Creator Spiritus indeed!